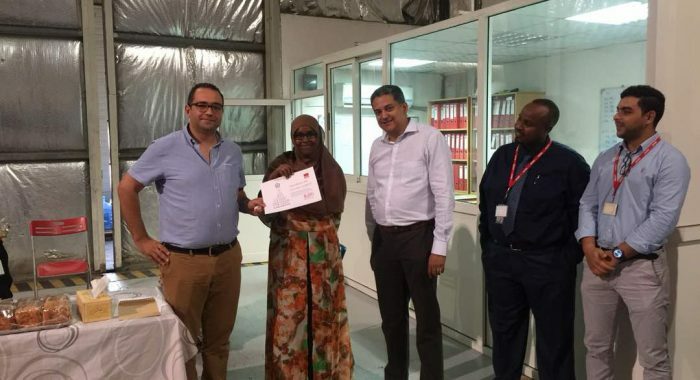 Oubah Ridwan, our Sales Associate in BMMI Djibouti has proved to be a true superstar amongst our highly dedicated and enthusiastic employees. During a recent monthly meeting, management was proud to share the great example Oubah has set with the team. A container of various frozen products dedicated to one of our key clients was saved from defrosting by Oubah. Knowing the importance of this container, she started from early morning, monitoring its temperature. Mid-day, she noticed a drastic change and took immediate action by informing her colleagues and the maintenance team to rectify the situation. Oubah explained that controlling the temperature of a refrigerated container is part of her usual routine- even though it is not in her scope of work. As soon as a container lands on the floor, she makes sure everything runs smoothly and also take sneak peeks during the offloading of products. Her main role as sales associate is to respond to all orders from customers and key clients who get food provisions from BMMI Djibouti. “Everyone’s responsibility impacts your own duty somehow in the company! At the end of the day, we are all in the same boat. We should all encourage and help each other to guarantee business runs smoothly” said Oubah. Demonstrating initiative and taking ownership are an essential part of personal growth and professional development which is why management has deservingly recognised Oubah with a Winning Heart certificate. This is a great example to share of how such attitude and actions set BMMI and its employees apart.